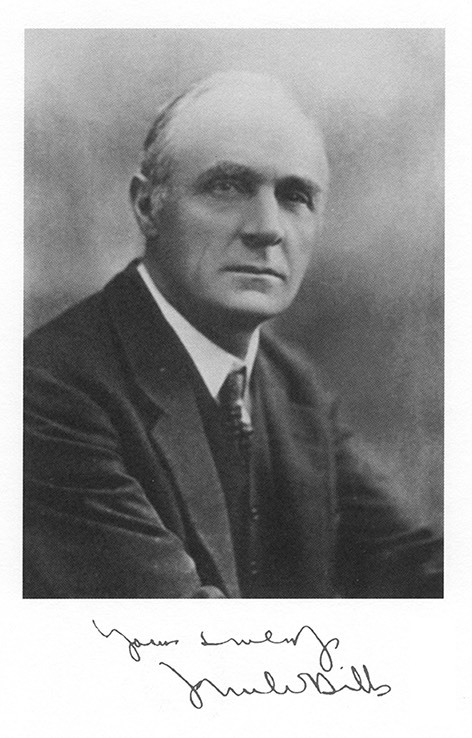 John Waller Hills was born in January 1867, living at both Corby Castle and High Head Castle near Carlisle. He went to Eton then Oxford, before becoming a solicitor in 1897 and marrying Stella Duckworth (Virginia Woolf’s half-sister) the same year. Stella died a few months later, and Hills remained a widower for thirty-four years, only marrying again in 1931. In 1906, he was elected as the Liberal Unionist MP for Durham. Hills volunteered for service in 1914, despite being in his forties, and rose to the rank of lieutenant-colonel at the Somme, but was badly wounded and then repatriated in 1916. After the war he returned to parliament. He lost his seat in 1922, then won the Ripon by-election as a Conservative three years later, and was re-elected three more times. From 1922 to 1923 he was Financial Secretary to the Treasury and was appointed a Privy Counsellor in 1929. Hills’ first book, published in 1921, was A History of Fly Fishing for Trout. The following year he co-authored The Golden River, about fishing in Paraguay; then, in 1924, his most famous book, A Summer on the Test, was published. More followed - The Dorado (co-authored in 1932), River Keeper (about William Lunn, 1934) and My Sporting Life in 1936. Hills died unexpectedly on 24th December, 1938, only a few days before he was due to be made a baronet.